File photo of students sleeping out last week outside Shanowen Hall used as Dublin City University accommodation. STUDENTS LIVING IN purpose-built private accommodation have no tenant rights when it comes to rent raises, need no notification when being evicted and aren’t able to complain to the Residential Tenancies Board. 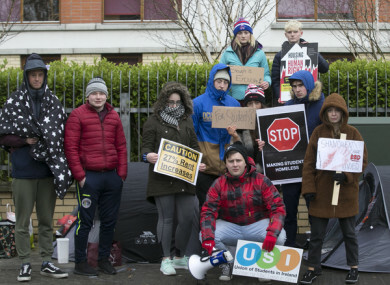 The issues facing students living in purpose-built student accommodation (PBSA) were brought into sharp focus last week, after a group of DCU students staged a number of protests over significant rent hikes. According to the DCU Students’ Union, the prices of the accommodation have increased six times in less than four years. Students slept out outside the complex for a night to highlight the issue, drawing national media attention and support from TDs and university officials. But what are the rights of students living in private, purpose-built accommodation? Ireland’s student numbers are rising significantly. A 2015 report from the Higher Education Authority (HEA) shows that the number of students in full-time third level education was set to rise from 168,000 in 2014 to 193,000 by 2024 (a rise of 25,000). On top of this, a feature of government policy includes making Ireland an attractive place for international students to come to study. Taking this into account, the HEA concluded that there was a deficit of about 25,000 student beds in 2014, with this number set to rise significantly. Following on from this, the number of international private companies providing purpose-built student accommodation (PBSA) – meaning, accommodation built specifically for students to live in - has jumped up significantly. Thousands of units of student accommodation have either been built or are in the planning stages in cities across the country (with the majority in Dublin, where demand is greatest). The new units being built are generally high-end, with en suite rooms in shared spaces generally costing about €220-€270 a week (these high costs have prompted a lot of criticism in the past). PBSA is not covered under the Residential Tenancies Acts, and it is not thought to be under the jurisdiction of the Residential Tenancies Board. As the RTB explains here, licencees cannot seek assistance from the RTB in the event of a dispute. Landlords can do things like raise the rent without warning and evict the tenant with little proper notice. Dublin city is covered by rent control legislation that was introduced in late 2016 which prevents landlords from raising the rent by more than 4% per year, however this does not apply to licencees. This is what allows Shanowen Student Residences to raise the rent in their buildings by over 25% a year, and is one of the main criticisms levelled against PBSA. “As we can see [students] are very exposed to the whims of student accommodation providers that decide that they’re going to increase their rents by way above the 4%,” John-Mark McCafferty, CEO with tenant support charity Threshold, told TheJournal.ie. So that’s a real concern for licencees who are by their nature low-income. McCafferty said that as the number of students staying in this type of accommodation has grown, more and more have been approaching Threshold for advice, but that their rights were limited under current laws. He said Threshold was limited in the help it could give to students living in PBSA dealing with issues. “We can advise them but it’s extremely limited. Because we can’t invoke the Residential Tenancies Act… they’re in a precarious and a vulnerable situation,” he said. It’s one thing if this accommodation was becoming a thing of the past, but there’s a necessity for the state to act principally if they want to see more student accommodation on the market and are facilitating that. He said that it was Threshold’s position that licencees in this position should have more protections in Irish law, and that the government needed to act to introduce these. McCafferty’s statements are echoed by DCU president Brian MacCraith, who last week said that government intervention was needed. “They could really do with an intervention from government to reassure them that they will not be yet again at the end of the exploitation channel,” the DCU president said. We’re very concerned about the really horrendous financial pressures being placed on students and families by the situation. TheJournal.ie contacted the RTB as well as the Departments of Education and Housing, who are both responsible for different aspects of student accommodation. A spokesperson for the Department of Education confirmed that a “licensing arrangement” was in place for certain types of private student accommodation, and that tenancies were exempt from the Residential Tenancies Act. They also said that officials are investigating the impact these arrangements are having on students. “The Minister of State for Higher Education, in conjunction with the Minister of State for Housing and Urban Development have requested that their officials investigate the impact of licencee arrangements on residents of purpose-built student accommodation,” the spokesperson said. A Dublin City Council spokesperson confirmed that there were no national guidelines in place for PBSA but that they are “a different use from residential apartments”. PBSA is not included therefore in recent updated guidelines and regulations for local authorities around standards for apartments. The spokesperson said that all new PBSA builds had to comply with the standards of the Dublin City Development Plan. They also said that PBSA can only be used for accommodation for students during term time and for tourists during holidays. “The use of student accommodation as permanent residential accommodation or conversion to residential apartments constitutes a change of use and would require a prior grant of planning permission,” they said. A Housing Department spokesperson repeated said that rent limits of 4% only apply in cases where there is a tenancy. “Where necessary the RTB will objectively assess every individual case to determine whether the arrangement amounts to a tenancy or a licence,” the said. Email “There are supposed to be rent limits in Dublin, so why can student accommodation providers hike rents by 27% a year? ”. Feedback on “There are supposed to be rent limits in Dublin, so why can student accommodation providers hike rents by 27% a year? ”.